Maximize production of digital direct-to-garment printing with the Hotronix® Hover Press™. Increase color vibrancy by curing direct-to-garment inks and cure pretreated shirts with ease. The upper platen actually hovers over the garment to ensure a stronger bond and brighter colors between the ink and the garment. Since there is no need for direct contact on the garment/graphic with this breakthrough technology, you never have to worry about messy direct-to-garment ink residue on your platen or Non-Stick cover sheet again. Two Modes - The first setting is for off contact and the second is for pressure. In both settings, once the cycle has ended, the press automatically pops up ensuring that the shirt will not be scorched or burned even if the operator is not standing by the machine. 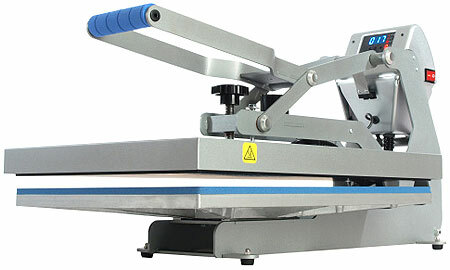 Three Settings - The Hotronix® Hover Press™ can be set in three combinations. In addition to hover and pressure settings, it also can be set to hover on the first and second settings or apply pressure on both settings.